Unlike most other survival games, you're not just chopping down trees, building a house and repeating. Volcanoids is a rather dynamic game, one where your base of operations is a rather large moving drill you command. That alone, makes it feel vastly different. A base that is both your home, your production line and your transportation all in one! While the initial tutorial is a little uh, flat, the games very quickly opens up into something quite exciting as it doesn't take you long to get command of your very own Drillship. As for performance, for the most part it's actually pretty good! However, when a volcano eruption happens the performance completely dives. Acceptable for now, since it's still heavily in development but I do hope they solve that quite quickly. The "TAA" antialiasing method also makes things terribly blurry, but other AA modes (FXAA, SMAA) are fine in it. Currently, it's single-player only but they have a firm plan to add in co-op and PvP modes as well. Given the setting and the game mechanics, that's going to be incredibly exciting. Hey, wanna come over my place? Sure, let me just burrow deep into the ground and pop up behind you. They're also planning new weapons, a better eruption effect, special load-out suits, a new research system and so on. You get the idea, it's going to change and evolve while it's in Early Access. For me personally, it's a game that has captured my interest and I absolutely plan to play a lot more of it. You can find it on Steam for £15.49/$19.99/€16.79. They said it's only about 8 hours to reach the end game, less if you know what you are doing. That's not a lot for this kind of game. Not sure i'm hyped anymore. Quote There's about 8 hours of gameplay, less when you know the game very well. You can win the game and finish the story. Story is told through intro (120s), outro (75s) and by captain during the gameplay. You start with no drillship, very soon you get small 1-segment drillship, which you extend. Research tree has three levels, each level has few items. Researching each item unlocks few modules, items and upgrades. Tchey They said it's only about 8 hours to reach the end game, less if you know what you are doing. That's not a lot for this kind of game. Not sure i'm hyped anymore. Well yeah, it has only just released. It's Early Access, don't expect a 40-50 hour experience from something just starting out. They know plenty of areas they need to expand, as shown on their roadmap. One thing I certainly want to see, is more to do outside of your ship, just more in general I guess. Still, enjoyable for sure. Being a Closed alpha tester i can say that this game will get better and better as the time passes. Devs are active and listening feedback. 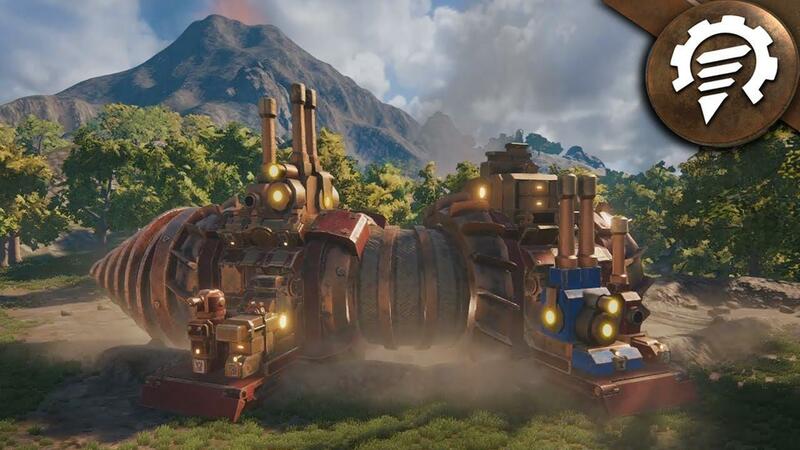 For me, biggest issue atm with the game is that the erruptions happen with such a small intervals that you dont really have much time to explore the worlds, but just build your stuff on your drillship and be sure to take it underground before the erruption. Gunplay could use some more kickback also and Enemy AI needs improvements, But what you currently get for the money is well worth it imo. Its something different to all other survival games, Has really interesting mechanics with your drillship upgrades and module expansions. I still haven't completed the game, though i have 11 hours of gameplay. But i was a tester so i always had to start from scratch when something big got fixed. What i hear is that when you finish the campaign you can still play it and explore the world and control the erruptions or something like that. Looking forward to the Coop. And special thanks to the devs who kept implementing new features and improving everything. I like how they also were really eager to fix Linux issues. At first we had like 2x less performance than we currently have. Erruptions tanked the FPS to 10-12 FPS and so on. Now it drops down to 30 with Erruptions but other than that it runs mostly solid 60+ on all maxed 1440p. I was an alpha tester as well and i must say ; devs are really listening feedbacks. Last build crashed in Vulkan for me but OGL version was fine. I guess that is an Unity issue. Game really improved on performance terms. I wish them good luck. It would have been cool if the game was survival from disaster events, not just volcanoes. That be cool survival game come to think of it. I wonder if they will include multiple types of volcanoes, because if your studied volcanology like I have then you know there are vastly different types all have unique ways to destroy the land. I don't know if I care about PvP for this one, or even guns for that matter. Overall, it's looking really cool. What exactly is goal in this game? DMG What exactly is goal in this game? In tutorial it keeps telling me to close the production module, then to open it. And over again and again. Anybody else had this? Time for a new laptop soon.